So you passed the Part 107 test, and now you’re working to build your aerial services business. But how do you get started, and what are some of the key things to keep in mind? These six tips were created to support you as you’re getting your business off the ground. Hope you find them helpful! Of course, the first thing you need to do is master basic flight proficiency. This may take a while, but it’s crucial. Make sure to use a cheap drone if you’re just starting out because you may well crash—trust me, it happens. Using an inexpensive drone will help you build confidence. Check out YouTube videos from other real estate marketers, virtual tour providers or from people in the aerial services you want to do, in order to get a sense of the kinds of shots professional drone pilots are doing. Practice orbits, side pans, and reveals, and develop a go-to list of shots for the type of work you want to do. This will help you get your skills up to speed, and will also mean that you know exactly what your workflow and process will be when you do land work. Pro Tip: Don’t forget to make the examples included in your portfolio as diverse as possible. It might even be worth taking a job or two for free/low pay if it is interesting, and will help beef up your portfolio. That being said, be careful about free work—most often people value services at what they cost. But if you really want a hotel in your resume, and you get an opportunity, it may be the time to jump on the moment. It’s hard to sell a service that you can’t prove you’re any good at. A portfolio helps demonstrate your expertise, and also gives people a way to find you online. It also lets people who have already hired you easily tell others about your work. The online aspect of putting together a portfolio can seem intimidating, but there are plenty of resources out there that are super user-friendly when it comes to building a website, and can help you get started. You can take a weekend to build your site on your own using YouTube tutorials to guide you, or you can find someone on a freelancing website like UpWork to help you at a relatively low cost. Pro Tip: If you do decide to hire someone to build your website, make sure you know exactly what you want. Make a list of how many pages you want created, what the text should be, what you want the architecture to look like, and so on. The more organized you are up front, the more you will save. 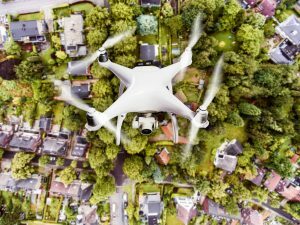 When it comes to hardware you don’t need to spend a fortune, but you do need to be thoughtful and make sure you have the drone, camera, and other equipment that suits the type of drone service work you do. There are plenty of camera drones out there for aerial cinematography, and you don’t need the latest and greatest system to get the job done. Focus instead on the end result you want to produce, and work backward to match the appropriate tool to the job. Sure, you could get a DJI Inspire 2 and attached DJI’s newest ZenMuse X7 camera to it—and you should, if you have the budget, and you know you’ll make the investment back through the work it will get you—but there are plenty of professional drone pilots out there still working with a Phantom Pro 2 and a GoPro. Do your research, think through your goals, and determine the appropriate hardware for your work. Let’s face it—sales is uncomfortable for many people. Just because you want to provide aerial services doesn’t mean you want to be a salesman or –woman. But having a sales strategy is crucial. You can bet that your competitors have one, and if you’re losing business to them, that could be why. To be clear, a sales strategy doesn’t have to mean you’re going to be a snake oil salesman, hocking bad goods for marked up prices. In fact, your strategy could center on complete transparency around pricing, and telling your clients exactly the value and concrete deliverables they’ll get for different price points. The point is, you have to think about sales—it doesn’t just happen on its own. Pro Tip: Because sales don’t come naturally for many of us, it helps to develop a sales script that you work through so that you have the language to fall back on when you’re trying to close a deal with a potential client. Make sure to work in information on pricing, service delivery, airspace research, insurance, and why you’re better than the guy without a remote pilot certificate who’s charging less, but probably has a lower quality product (not to mention he’s operating illegally). Your most likely customers are probably right in your neighborhood. So if you’re going to spend money on marketing to bring in leads, make sure you’re spending locally. Online, this would be targeted Facebook ads, or targeted Google ads with Google AdWords, and similarly targeted efforts (it’s pretty amazing how targeted you can get with geographic and demographic data points using digital ads these days—which means you don’t need to waste money showing your ads to people who aren’t relevant to you). Offline, marketing local means creating a list of real estate brokers in your local market, or running free drone workshops with real estate offices to establish your expertise and educate potential clients on the value you can provide. If you can show local brokers how much is required to do aerial shoots on their own—buying a drone, learning how to fly, getting certified, buying the right insurance, handling post-production—they may well hire you instead of going to all that trouble. And either way, making local contacts will give you the chance to share your portfolio and get it in front of more people (remember item #1 from this list!). Don’t forget to continue honing your skills. Sometimes you can get so busy with the day-to-day of creating and running a business that your skillsets stagnate. Don’t let this happen! The more you can be working to become better, the more your work will stand out. Even if you only set aside one or two hours a week for your own growth—whether it’s in post-production, or learning how to use a new sensor like one for aerial thermography, or maintaining and beefing up your flying chops, the investment will pay dividends as times passes and you continue to improve. And remember—the better you are, the more quickly you can work and the more you can charge. Pretty sweet. Know a high school student who wants to get FAA certified to be a commercial drone pilot? Make sure to tell him or her about Drone Pilot Ground School’s new High School STEM Scholarship for Aspiring Commercial Drone Pilots. One last tip – Get connected with a National Drone Service provider to increase your chances of snagging jobs from large national and international drone photo and video initiatives.